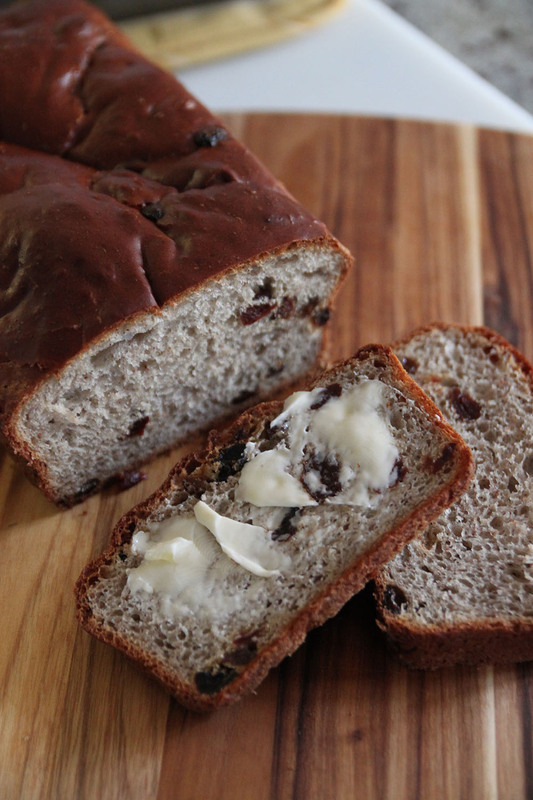 Studded with chewy fruit and toasty spices, this easy no knead bread is perfect for breakfast. Measure the first 7 ingredients into a bowl; blend. Set aside. Pour the water into a mixing bowl; add the sugar and yeast. Stir in and let stand 3 to 5 minutes. Add the egg, prunes and ½ the flour-mixture. Beat 2 minutes with electric mixer on medium speed, or by hand until smooth. STOP MIXER. Add the rest of the ingredients and beat again with a spoon until smooth...1 to 1½ minutes. Scrape down batter from sides of bowl. Cover. Let rise in warm place until doubled, about 45 minutes. Meanwhile grease one 5x9-inch OR 4½ x 8½ -inch loaf pan. Beat down raised batter in about 25 strokes. This is a thick, somewhat sticky batter; spread evenly in the pan. Tap pan on table to settle the batter. Let rise only until edges of batter come to within 1-inch of top of large pan or reach top of smaller pan, about 30 minutes. Bake 40 to 50 minutes or until well browned on sides and top, in preheated 375°F oven. Remove from pan and cool on rack. Brush with butter.